I always get excited when I successfully tweak or find a good omnivore safe vegan recipe. I hope to share any I find that I personally actually enjoy because I’m sure there are others in my predicament. I’d love to hear of any you may have success with too. 1. Stir to combine the first group of ingredients. 2. In a separate bowl mix the Ener-G with water and then beat with an electric mixer until fluffy. 4. 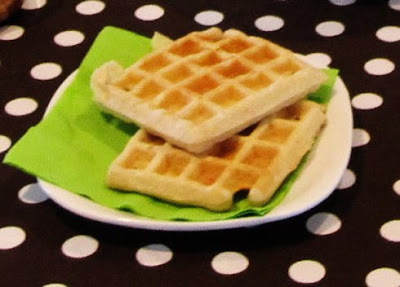 Scoop and bake in a waffle maker. If you’ve never used Ener-G I love it. It’s a great egg replacer in baked goods and I use it all the time when I coat meat for breading and that sort of thing. It lasts forever so it’s nice to have it on hand. If you don’t have vegans to feed you can use regular milk instead of soy milk and 2 eggs instead of the Ener-G and water. But mix the egg yolks in with the flour mixture and beat and fold in the egg whites. p.s. This guac recipe I posted a while back is vegan and is the best guacamole I have ever tasted. People eat it up and always love it anywhere I take it. Hey there, I am not vegan but cannot eat dairy or eggs at the moment because I’m nursing my daughter whose milk protein intolerant. I found this list for egg substitutes from a company website that makes fabulous baked goods. The kind I would love to eat even if I could eat dairy. So, thought I’d leave it for you, and the bakery uses tofu in their cookies and they are the best. I haven’t had a chance to experiment because our babe is in the hospital awaiting heart surgery, but if you play and discover something good I would love if you’d share! Thanks! I just wanted to let you know that we love this recipe! I make it with flax “eggs” (1 Tbsp flax meal + 3 Tbsp hot water = 1 egg), and they turn out delicious! I don’t know of a cookbook that fits your description, but the “Idiots” and “Dummies” books have gotten me through raw cooking painlessly, so that’s where I would look first, personally. There may be some at your local library, too. Although, judging from this recipe, you probably don’t really need a cookbook. Thank you! Oh, and we use the Namaste Perfect Flour Blend to make them gluten-free without issue. Thanks again for the yummy recipe! oh that’s good to know my FIL is trying to be gluten free so it’s nice to know which stuff translates well!